Boy child mannequin with realistic facial features and sculpted hair. He wears size 6T. 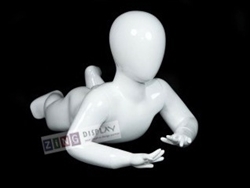 Posed with his hands at his side, he will add some playfulness to your child merchandise display. Fleshtone color and made of fiberglass. Arms and legs come off for easy dressing. Base included.